When the cold winter weather sets in, sometimes we just need a hearty, hot meal to warm us up and get that chill out of our bones. And what better meal to enjoy in the wintertime than a piping hot bowl of savory chili? We don’t think there’s much! Chili is a great meal because it fills you up and you usually make it in big batches. You can feed a crowd or save the leftovers for a second or even third meal! 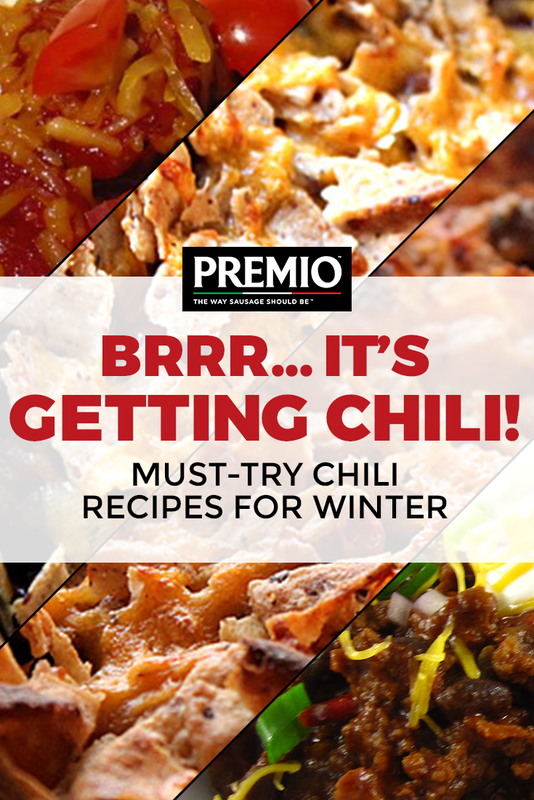 At Premio Foods, we’ve collected several amazing chili recipes for you to try out this winter. From spicier dishes to a milder taste, we’ve got a recipe you’re sure to love. Check out four of our recipes below and get cooking! Using a classic hot Italian sausage in this Hot Italian Chili recipe really adds something special to it. Combined with ground beef, veggies, beans and seasoning, you’ve got a fantastic flavor in this one dish! By cooking it in the slow cooker, you let all of those flavors blend together and complement each other perfectly. Every bite of this Hot Italian Chili will warm you up from the inside out and keep you feeling great. Our recipe for Cheesy Spicy Chili Sausage Dip works great for all kinds of different occasions. Serve it at your next party to give your guests something savory and filling to munch on, whether you eat it with chips or a fresh sliced baguette. You could make it for dinner for you and your family as a side or even as the main dish. Or, when you’re looking for something to bring to a potluck, this will become your go-to recipe! When you’re looking for something with a little more spice, be sure to try our Red Hot Chili with Rum recipe. With every bite, you’ll feel the tingly goodness of a dish that’s infused with spice at every step. From the fresh hot pepper to the chili powder to the hot sauce topping, this recipe is only for those who like to test their limits with spiciness — it’s not for the faint of heart! But, for the spicy food aficionados, it’s a real treat you’re sure to love. If you like spice but not too much, our recipe for Chipotle Chorizo Chili is a great pick. The rehydrated chipotle chilis give the chili a kick, but the flavor is not too overwhelming. Other flavors, like the coffee and chocolate, offset some of the heat to make it less overpowering. All of the ingredients in this simmer low and slow to make sure everything blends together and get all of those flavors to come out. Use Premio’s best chorizo sausage for extra flavor! From our Hot Italian Sausage to our Hot and Spicy Italian Chicken Sausage, Premio makes the best quality fine Italian sausage. With our experience and dedication to using the best ingredients, you can really taste the difference. When you’re trying out any of these recipes, be sure to cook with Premio. To find Premio sausage at your nearest retailer, use our store locator today.